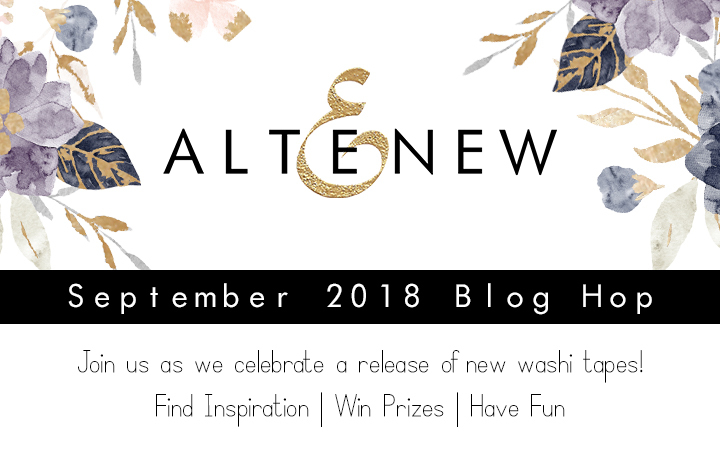 Welcome to the September 2018 Washi Release and GIVEAWAY. If you have come from Laura Bassen's blog then you are right on track. You can also start on the Altenew Card blog. I had so much fun creating with the washit tapes. I think they are my favourite product of all time. I love the different size and the design are right up my alley. I could have kept on creating but had to stop. My first project was a card. I used the Leaf washi tape and created a background for the card. I cut out the parrot shape using the die from Parrot Paradise. Then I added a stamped and coloured image that I had created some time ago but never used. I also used the Golden Edge Washi tape to add some gold touches. For my layout I did LOTS and LOTS of fussy cutting. I used the Painted Orchids Washi Tape. How did I make the layout? You can find out in the video below. The layout is actually very simple. The only part which takes a bit of time is the cutting of the flowers. The SUMMER card was made on one of my Facebook Lives which you can watch here (technique starts at 35:29) if you want. I also had some labels laying around from a project I created some time ago. I love these labels from the Dot Label Set. The sentiments are from the Charmed Stamp Set. I also quickly made a card with the leftovers. I love creating a layout and then making a card with a similar feel. I always feel a little lost when it comes to cards but when I make them after having created a layout I have more ideas and it is less daunting. I bet you have a favourite washi tape or maybe several. Wouldn't it be great if you could win some spending money and buy some? I am also giving away a 30$ gift certificate to the Altenew store. Just leave a comment here on my blog. I'll pick a winner on October 3rd. Need some more inspiration? Hop over to Virginia's blog. She has some amazing projects to show you. Great cards and layout! The new tapes are amazing! Great use of the new Washi tapes! 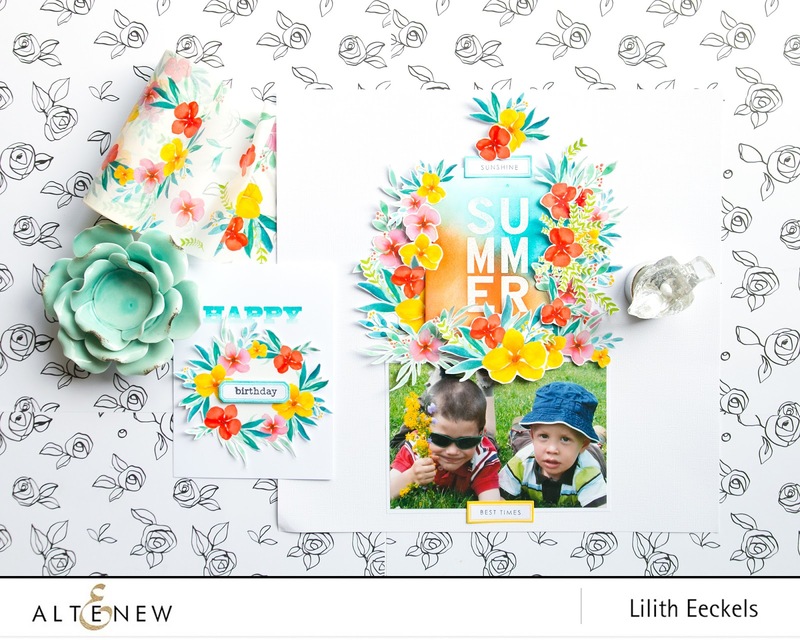 Beautiful layout using those very cheerful flowers! Love it! These cards are absolutely gorgeous, thanks for sharing. LOVE the new tapes! Can't wait to get some. The gift card would sure help!! Beautiful new washi tapes!! Love your projects, especially the floral ones... such a gorgeous pop of colors! Thank you for showing the versatility of these Washi tapes. Your layout is gorgeous. Awesome use of the pretty washi. I love the wreath!! Beautiful cards and layout. What a great way to use washi tape. Thank you for sharing and the inspiration you've given me. Cannot believe all the beautiful prints being offered. I love your LO with the fussy cut blooms. Totally worth the effort! Those kiddies are precious. Love the bold colors of this Washi Tape! You did an awesome job showcasing it Lilith! Thanks for the inspiration! Beautiful use of the floral tape. The new tapes and ideas are awesome. These washi tapes are amazing. Your cards are beautiful. I love the cards an layout. The Washi sure makes thing easier. Gorgeous cards. So much fun! Fussy cutting?!! You have more patience than I do! These are lovely. Love the Painted Fantasy One! Such a joy to look at,your cards!! such lovely cards and wonderful layout with these new, fabulous washi tapes - i want them all!! Im sure the washi made the card quick to make. It is beautiful. Also, the layout is fabulous. I've never seen washi tape like this before and it is definitely a winner with me. Great creations you've made using the washi. These tapes are just amazing! Love the vibrant colors. Love what you did with that floral washi tape! I had the same idea, to fussy cut some floral washi tape. If I’ll need any help I’ll check out the video. Such amazing tape and I love how you used it! Beautiful washi tapes! Love the way your have used them, too! Very cool card, I love that parrot and your layout is beautiful with the fussy cut florals. I do have my eye on a few of these new Washi tapes and winning one of the giveaways would get me some sooner lol. Thanks for sharing your projects today and the awesome inspiration. Great layout, love the vibrant colors. What a beautiful page. And lovely card! I love all the Washi tapes but the Painted Orchids is my absolute favorite!! I can’t believe you actually fussy cut all of those flowers. You must have a lot of patience!! I love how everything turned out!! These are all fantastic! I love seeing scrapbook layouts. I can never get enough ideas. This one is lovely with all the flowers. Beautiful technique. Those Washi Tapes are yummy. Can't wait to get my hands on some!! Love your beautiful layout! What a lot of fussy cutting but perfect results. Your "left-overs" card is beautiful also. I love these wide washi tapes! Beautiful layout and card. I love the new washi tapes. So pretty. I most definitely should be using more of the washi tape that I already own!! Liked the vibrant colors you created with the scrapbook page and cards. Each one of these tapes are so delicious. I love the galaxy and nebula. The florals are great too. Your cards are great and love that layout on your page too. Lilith your layout is spectacular and card is so happy and bright. Wonderful ideas and colour choices. These Washi Tapes are going to become a staple in the craft room, so versatile. I just love these new washi tape patterns and sizes! Beautiful card and layout! I love all the fabulous ideas! Thanks for the inspiration! Just love seeing all of the great, unique ways to use the washi! Your cards are beautiful! I love the wide washi tapes and you made some beautiful cards with them. The Summer layout is wonderful! Beautiful layout. Love this washi tape. Love the beautiful layout. Can't wait to get the washi tape. Wonderful layout and cards with these washi tapes. It's great to see how many different ways washi tape can be used. Thank you for sharing such beautiful projects. Although the fussy cutting is a little daunting, these new washi tapes are gorgeous! Although the fussy cutting is a bit daunting, these new washi tapes are beautiful! I watched the new washi release video, but somehow I missed the leaf one! It's so pretty, and the perfect backdrop for the parrot. I'm glad you used it. And your layout is beautiful. Thank you for sharing your creativity and projects with us! Oh my gosh I am so loving your projects! Using that Painted Orchid Washi Tape is absolutely gorgeous! Your fussy cutting is amazing! Beautiful layout! These washi tapes are so beautiful! I'm really inspired to try them! Wow! Thanks for the amazing inspiration. These washi tapes are so gorgeous! Beautiful!! I love the layout!! The washi Tape Is beautiful! Thank you for the inspiration!! What a beautiful layout you created with the new washi tapes! 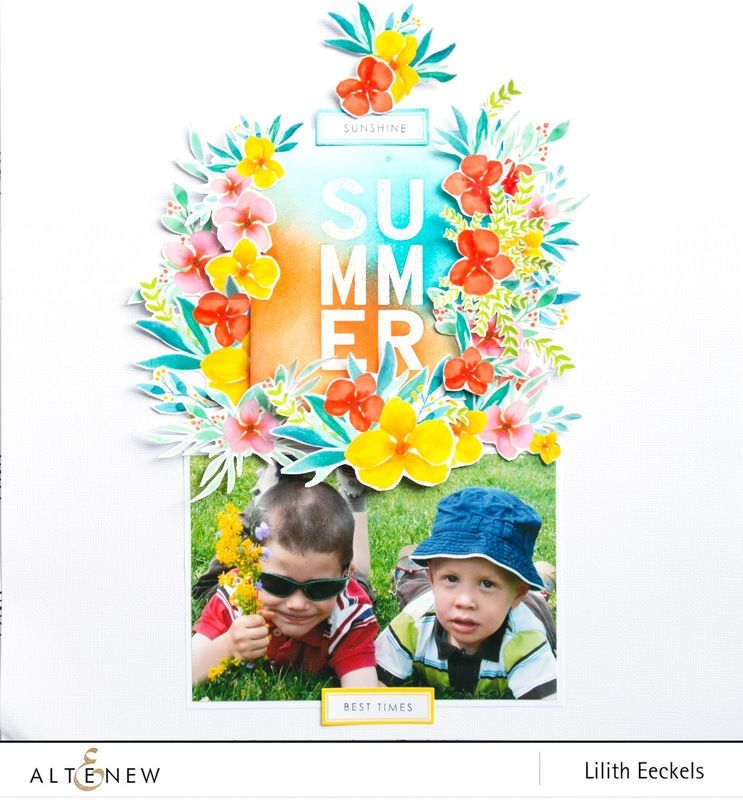 I really enjoy the bright colors of the florals in your layout and how they match the flowers your son is holding! A great idea and done so well! TFS! Great ideas. Love the gold edges with the washi tape. Love the tape you chose. It's beautiful. All that fussy-cutting was definitely worth it and you picked the perfect washi tapes for your images. The card is pretty, but I love your layout! It is more than beautiful. I never imagined Washi tape would be so wide & so fabulous. I don't scrapbook, but I love your pages! I LOVE the layout! I’ve been trying for some time to find the large washi tape and am SO HAPPY Altenew has it! Thank you! Amazing use of the orchid washi tape! I love how you used this washi tape on your card and then cut out the florals for your layout! This is so pretty. Beautiful creations! So much detail is wonderful. I'm in love with the Gilded Ombre tape! Beautiful! Amazing cards and the layout! I love the idea of fussy-cutting as an extra use of these washi tapes! The new washi designs are gorgeous!!! Gorgeous scrapbook layout. 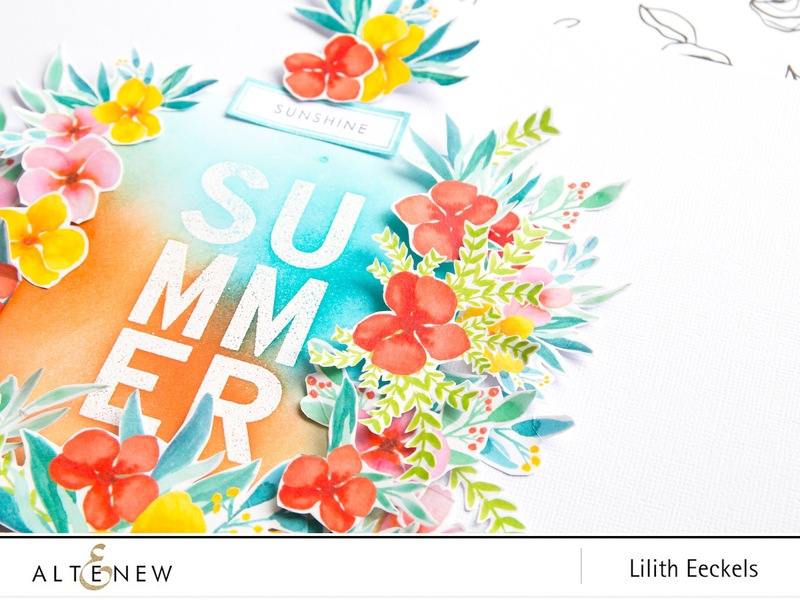 I love how you used the washi tape to create a wreath around the Summer card you created earlier and used it to embellish your layout. Your sons are darling and the flowers he's holding match the layout design so well. Thanks for sharing your time and talent with us. Such a pretty layout! Great idea to use the washi that way! Beautiful layout! Love the washi! Love the pretty colors of the washi on your Lo. A perfect accompaniment to the photo of your boys picking flowers for you. A sweet memory! The card is also lovely. Great new release from Altenew. TFS. Beautiful layout!! What a great idea to actually cut some of the images out of the tape!! Gorgeous layout! Thank you for sharing. The picture that you picked is perfect for the painted Orchids washi. I really love how you used this amazing washi tapes to make such beautiful projects. The layout is so gorgeous! Thanks for the inspiration. Gorgeous use of the wide washi tape, love it! such lovely cards and wonderful layout with these fabulous washi tapes! I love your scrapbook page. The floral arrangement is amazing! Amazing release of washi!! Wonderful card! 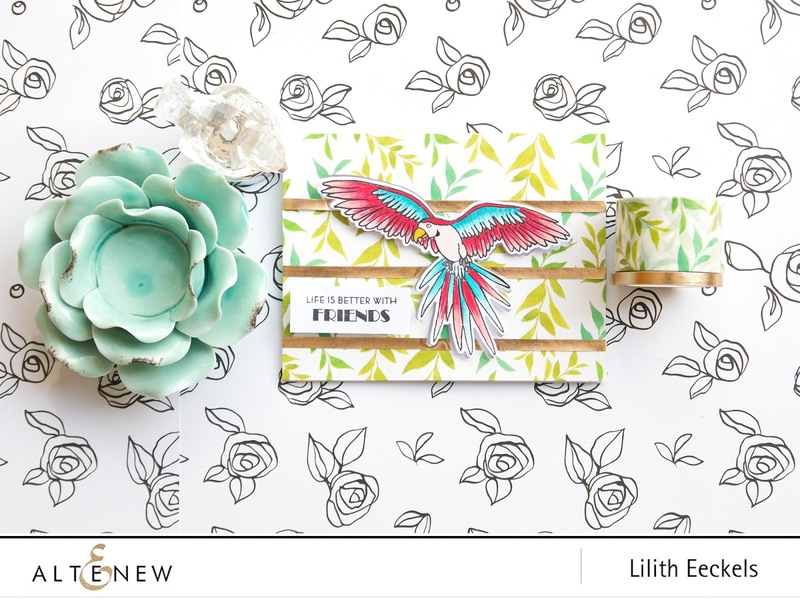 Hi Lilith, You bety if I am lucky enough to win that I am spending every cent on this gorgeous Washi tape!! I LOVE your cards, the first one, I have that parrot stamp set, love how you incorporated the washi in it, so AWESOME. I also love that you showed how you can use washi in a layouts, that was very cool, a lot of people would not visual see that, yours was such a awesome layout, I will come back to see your video, the blog hop is so long I have to finish I got a late start but I want to see who those two little cuties are, so adorable!! and how cool was it that you could make that really pretty 3rd card. This has been a AMAZING post and I Thank You!!! Wow, gorgeous cards and layout! You’ve so beautifully displayed the versatility of the new washi tapes. Absolutely beautiful. My favourite is the orchids design, and your fussy cutting detail. All that fussy cutting was worth it! Beautiful cards and layout. What fabulous layout & cards, the parrot works so great against that tape. Like that you didn't waste your leftovers & you got a great card out of it. Going to get three of these as my budget might manage three. 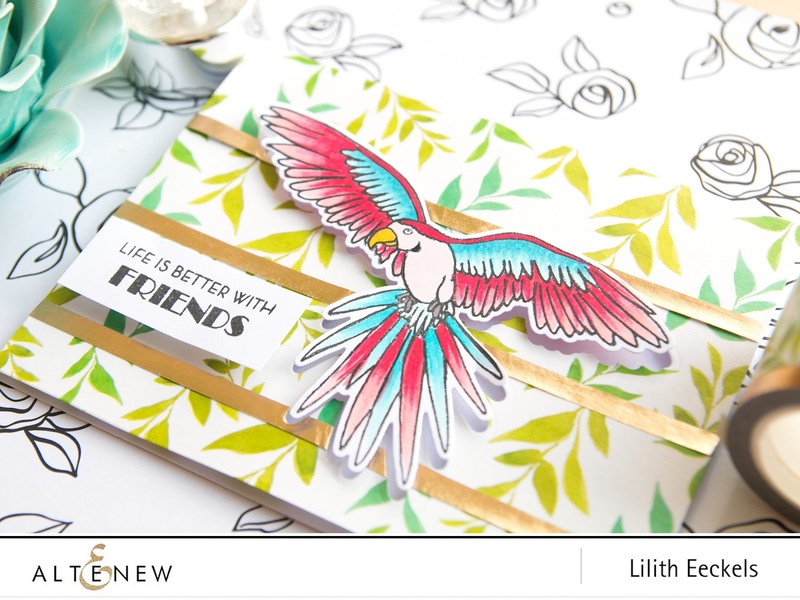 Your colorful bird and this pretty leaf wash tape are the perfect pairing! This is really a beautiful idea! Those projects are beautiful. I love this new washi, and you've used some of my favorites. 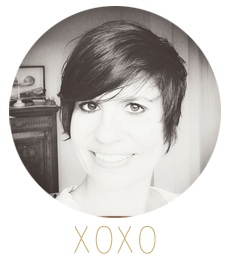 What I love about your blog was the fact that you were genuine in your thought. You continually played with the flowers you cut out from the washi tape until you were happy with the placement. It showed me that even as a seasoned blogger, you have to take the time to work through your project until your happy with it. Sometimes, I get discouraged and give up, so it was vey encouraging for me to see that. Beautiful layouts!!! Love the colors and the new washi tapes are amazing!! 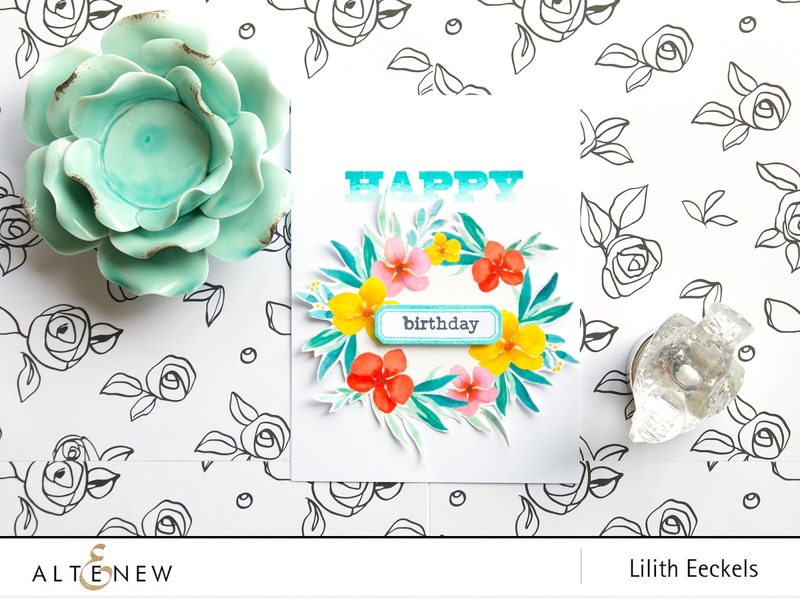 Love your vibrant tropical colored layout and card using Altenew's newest washi! The parrot matched perfectly with the theme and is is stunning!!! Love the idea of using every last piece of these pieces!! Beautiful projects! I love your parrot! I love your versatile techniques using the Washi tapes! A lovely layout and cards! Thanks for sharing! Your projects are all so inspiring! Love the new washi and how you used it....fantastic!! Your cards and layout page are wonderful! Amazed at your patience in cutting out the flowers! The vibrant colours look so wonderful as a layout and you did such a nice job layering them all together! Very pretty cards and layout... I love the fussy cut florals from that gorgeous washi tape!